We’d love your help. Let us know what’s wrong with this preview of Capturing Music by Thomas Forrest Kelly. In today s digital landscape, we have the luxury of experiencing music anytime, anywhere. But before this instant accessibility and dizzying array of formats before CDs, the eight-track tape, the radio, and the turntable there was only one recording technology: music notation. It allowed singers and soloists to travel across great distances and perform their work with stun In today s digital landscape, we have the luxury of experiencing music anytime, anywhere. But before this instant accessibility and dizzying array of formats before CDs, the eight-track tape, the radio, and the turntable there was only one recording technology: music notation. It allowed singers and soloists to travel across great distances and perform their work with stunning fidelity, a feat that we now very much take for granted. Thomas Forrest Kelly transports us to the lively and complex world of monks and monasteries, of a dove singing holy chants into the ear of a saint, and of bustling activity in the Cathedral of Notre Dame an era when the only way to share even the simplest song was to learn it by rote, church to church and person to person. With clarity and a sense of wonder, Kelly tells a story that spans five hundred years, leading us on a journey through medieval Europe and showing how we learned to keep track of rhythm, melody, and precise pitch with a degree of accuracy previously unimagined. To ask other readers questions about Capturing Music, please sign up. Fascinating story of the development of musical notation systems in Europe. Modern notation is based on these systems and it is interesting to see where the ideas came from and how they spread, sometimes after initial resistance. The images of medieval manuscripts are quite lovely, but I'm very glad I don't have to try to interpret them. The systems seem ridiculously complex compared to modern systems, especially for rhythm. The title is misleading. The book does not really tell the full "story o Fascinating story of the development of musical notation systems in Europe. Modern notation is based on these systems and it is interesting to see where the ideas came from and how they spread, sometimes after initial resistance. This wasn't bad. At least it didn't feel like a textbook, so that's nice. It almost made me wish I had attended more lecture sessions of my early music history course during undergrad years. But not quite. Loved how Kelly connects a human reason to each development in notation: brilliant problem-solving that met very real needs of a living, breathing language as it evolved and became more complex over time. Content is quite academic and meticulously researched, but Kelly has an engaging, impressively succinct writing style. More of my thoughts on this title can be found on my blog at A Lovely Bookshelf on the Wall. I found this history of the origins of written music notation quite interesting. The focus is entirely on the middle ages, starting with the earliest attempts at writing down music (simple marks to remind performers of things) and following the evolution to the basis of our modern notation, including precise notation of rhythm. He addresses two key aspects of notation: pitch and rhythm, with the focus primarily on rhythm. I appreciated that he delved into the philosophical side of things and hig I found this history of the origins of written music notation quite interesting. The focus is entirely on the middle ages, starting with the earliest attempts at writing down music (simple marks to remind performers of things) and following the evolution to the basis of our modern notation, including precise notation of rhythm. He addresses two key aspects of notation: pitch and rhythm, with the focus primarily on rhythm. I appreciated that he delved into the philosophical side of things and highlights how truly incredible and revolutionary is this idea of notating something that occurs in time -- of "recording" music. The evolution of the notation of rhythm is closely related to mathematics and scientific advancements (for example, clocks) and he explains and contextualizes it really well. I came away with a new appreciation for the accomplishments of the middle ages! I particularly enjoyed learning about how the composers of the middle ages pushed the limits of mathematical complexity with regards to notating rhythm, creating pieces that were not rivaled again in their complexity until the 20th century. Our current notation evolved from their systems, but is in some senses actually a simplification of the greater complexity they experimented with. I was a little disappointed that the author doesn't address the origin of notating precise pitch, different keys, semi-tones vs. whole tones, etc. However, the book is complete unto itself and I think such a history would be a whole separate book. It makes sense that early music did not have to deal with these complexities since it evolved from singing, not instruments that are tuned. And I do truly understand now how revolutionary and crucial it was to just invent how to notate rhythm. How do you make a book about the history of musical notation interesting to those who find the history of musical notation not at all interesting? Turn it into a small coffee table book. I do find it interesting, so I was already on board, but this book is as beautiful as it is interesting. So, it's not an academic-academic book, and you need to look elsewhere for such a thing; nor is it easy to get into, because Kelly's first few chapters are... well, disordered, to put it mildly. Once he gets How do you make a book about the history of musical notation interesting to those who find the history of musical notation not at all interesting? Turn it into a small coffee table book. I do find it interesting, so I was already on board, but this book is as beautiful as it is interesting. So, it's not an academic-academic book, and you need to look elsewhere for such a thing; nor is it easy to get into, because Kelly's first few chapters are... well, disordered, to put it mildly. Once he gets on to the actual narrative though--rather than trying to convince you that the idea of notating music is, in itself, a great and counter-intuitive idea--it flows very nicely. This lavishly produced book, with its gorgeous reproductions of music manuscripts and accompanying music CD, belie the enthusiastically chatty text chronicling the medieval innovations of western music notation that recorded their music for the future. 4.5 stars. As medieval music notation books go, this is a *much* nicer read for the motivate layman than, say, Apel's "The notation of polyphonic music, 900-1600". Was surprised to see a book published in 2015 include a physical CD instead of some download link. But it did give me an excuse to finally hear what Cordier's "Belle, bonne, sage" sounds like. I rated it three stars for my experience only. This has never been and will never be my area of music. The text is well-explained and well-researched, and interestingly written. However, it's still hard to get through if you aren't into history or measured musical text. Easy to read but hard to finish. This review has been hidden because it contains spoilers. To view it, click here. When I started learning how to play the guitar I also started reading a bit of music theory and the first thing that struck me was how non-scientific it seemed. Where do the note names come from, why choose Do Re Mi / A B C? How does one define A precisely (or any other note)? Why does one have to memorize all of these relations between notes (scales, chords) when it's obvious that there exist deeper explanations for why a chord sounds "good" and another "doesn't"? I was looking for mathematical When I started learning how to play the guitar I also started reading a bit of music theory and the first thing that struck me was how non-scientific it seemed. Where do the note names come from, why choose Do Re Mi / A B C? How does one define A precisely (or any other note)? Why does one have to memorize all of these relations between notes (scales, chords) when it's obvious that there exist deeper explanations for why a chord sounds "good" and another "doesn't"? I was looking for mathematical and physical explanations for everything that was taught about music theory in the sources I was studying. I did not find these explanations in this book but I did find the reasons for why (Western) musical notation looks the way it does today. The book is gorgeously illustrated and the author goes from (what I believe is) the earliest form of notation, neumes, to the medieval period where the notation closely resembles the one in use today. 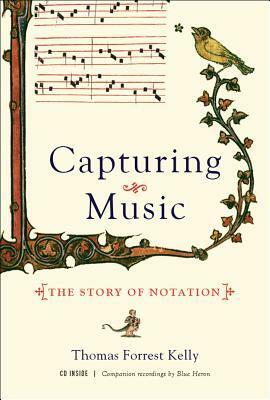 For a musician (and especially for one focusing on the history of music) the book might seem superficial and cursory but for the layman it provides a great introduction into the subject of history of notation. I wish there was a chapter dedicated to other notation systems than european ones and perhaps more details about the period of time between the medieval ages and the present; therefore just four stars. Guido the Monk - complaining that singers have to learn each song separately because they had no system in place (as opposed to the other crafts where one learns the technique and then applies it to each new task). Neumes - first system that caught on, even though other systems existed (alphabets, Dasian). They show the direction of sounds, the "motion". Many medieval systems based on neumes, each with their own subtleties. One still has to know the song in advance when using neumes. Guido came up with a system that represents pitch, notes were arranged on multiple horizontal lines, each one corresponding to a different pitch. The pitches were based on Ut queant laxis, a common chant. Decline in quality, chants were known as flat songs, due to loss of expresiveness in the new notation (when compared to neumes). Rhythym notation appeared because of the need to synchronize voices in polyphonic chants. When the new voice sings more than one note for the original chant there is a need for syncing. Rhythm was created by having note groups arranged in a specific pattern interpreted as a series of short notes and long notes (twice as long as the short notes). That is, a three-note group followed by a series of two note groups would be sung as long-short-long, short-long, short-long, etc. This was purely a convention which one had to know, the rhythm isn't encoded in the notation in any way. This book is not intended to be a manual of music notation rules and style, but rather a history of the development of music notation. And a fascinating history it is. If you've ever wondered why the lowest line of the bass clef is a "G", why the grand staff splits at middle C (which is close, but not the middle of a piano keyboard), where the names of the G and F clefs come from, why note lengths are encoded by flags and dots, then this is your book. Throughout, there are many full-color plates This book is not intended to be a manual of music notation rules and style, but rather a history of the development of music notation. And a fascinating history it is. If you've ever wondered why the lowest line of the bass clef is a "G", why the grand staff splits at middle C (which is close, but not the middle of a piano keyboard), where the names of the G and F clefs come from, why note lengths are encoded by flags and dots, then this is your book. Throughout, there are many full-color plates of ancient manuscripts illustrating points made in the text. There is even a CD in the back cover containing tracks of Gregorian chants and other musical styles, each keyed to a specific example in the book. The author also emphasizes the interplay between musical practice and musical notation and how that interplay affected the evolution of notation. For example, the author mentions two principles at the foundation of the Western musical system (p.12): "first, that this music is meant to go with words; and second, that the basic unit of music-writing is not the note, but the syllable". Although the book is an easy/fun read, it contains so much information and history that it will be a reference to which you will constantly return. E.g., when was tablature first used (ans., 200 BC); where did 'do, re', mi..' names come from (see p.68); why does the word 'gamut' have its origins in musical notation? I couldn't possibly remember all the facts/dates/names mentioned in the book, so I try to remember the main themes and approximate dates - when/why did the grand staff appear, when/why did rhythmic notation become important to notate, when/why did Italians get to coin all those names for dynamics/performance - the rest I'll have to look up again in this wonderful reference. This book looks at the creation and evolution of musical notation in medieval Western Europe, showing how transcription came to focus on pitch and rhythm, and the things people tried to convey those aspects of melody. Kelly is infectiously in love with his subject, and manages to throw in a fair amount of humor or at least lightness of tone, but the book takes some deep dives into medieval music theory, which is likely to be pretty heavy sledding for a lot of readers. It's also somewhat off-putt This book looks at the creation and evolution of musical notation in medieval Western Europe, showing how transcription came to focus on pitch and rhythm, and the things people tried to convey those aspects of melody. Kelly is infectiously in love with his subject, and manages to throw in a fair amount of humor or at least lightness of tone, but the book takes some deep dives into medieval music theory, which is likely to be pretty heavy sledding for a lot of readers. It's also somewhat off-putting how frequently he declares that something he's talking about is "fascinating" (isn't that for readers to decide?) and how all the musical effects he describes are "beautiful" (obviously as the author he gets to choose examples he likes, but the repetition does eventually make him seem undiscriminating). At least he is self-aware about describing so many things as "breakthroughs." If you enjoy books about history, philosophy or technology, this is a great read. But if you love music, consider making this book a must read! Kelly calls the creation of musical notation - "a celebration of mankind's technical achievements of the Middle Ages." However, this reader believes the real achievement is the writer's ability to discuss a complex subject in an understandable, easy manner. You don't need to know anything about music notation to enjoy Capturing Music. Beautifully illustr If you enjoy books about history, philosophy or technology, this is a great read. But if you love music, consider making this book a must read! Kelly calls the creation of musical notation - "a celebration of mankind's technical achievements of the Middle Ages." However, this reader believes the real achievement is the writer's ability to discuss a complex subject in an understandable, easy manner. You don't need to know anything about music notation to enjoy Capturing Music. Beautifully illustrated with an accompanying CD, this book is an engaging story and a sensory delight. Three stars just for writing about something I've never given any thought to. The early content was fascinating, but in the later chapters when not much changed in notation, I didn't glean much. A strong music background isn't necessary to enjoy the book, although some passing knowledge of music notation is helpful. I suspect the later chapters mean more to those who identify as musicians. The most unexpected piece of knowledge in this book? The origins of do re mi. A beautiful book visually. I wish it went a little bit further historically. It stops in the Renaissance era, taking the remainder of notation's history as a fait accompli. Certainly worth reading, but not as good as I had hoped. The book was nice and detailed for what it was. While musical notation was certainly an invention of the Middle Ages, and the author gives us a great amount of detail regarding that time period, he breezes past the 14th century in just 5 or so pages. I was left feeling it was worth more than that. Thoroughly researched and recommended for music enthusiasts. I want to read this because of a review in the Wall Street Journal. It is supposed to be about how the system of music notation developed in the middle ages. I would LOVE to own this book! I do wish that instead of a CD, or as an alternative, you could download the accompanying tracks. learned so much from this book, and Professor Kelly's enthusiasm is infectious. An American musicologist, musician, and scholar. He is the Morton B. Knafel Professor of Music at Harvard University.